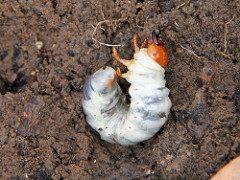 Grubs are the larva form of other insect pest. Grubs themselves can cause lawn damage and controlling them as larva may help control the adult forms of the insect. What Problems Do Grubs Cause? They eat the roots and stems of small and young plants which can cause disease and kill the plants. An often over looked problem that grubs cause is they attract other pests. Many animals eat grubs and that can damage your lawn as well. One of the biggest problems is that Moles like to eat grubs and they can cause more damage than the grubs call. How Do You Get Rid Of Or Control Grubs? Bayer Advanced 12-lb, season long grub control with Turf Revitalizer. Improved formula, treats up to 5,000 sq ft. Patented 2-in-1 formula kills Grubs all season long PLUS promotes strong roots and thicker turf. Contains Merit®. 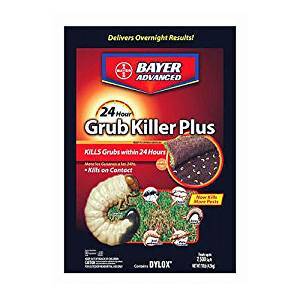 24 Hour Grub Killer with Dylox *Nothing kills grubs quicker. *Ideal for stopping serious grub infestations. *Quickly works its way into the grub “kill zone.” *Does not linger in the soil like diazinon or dursban. *Kills mole crickets, sod webworms and cutworms. 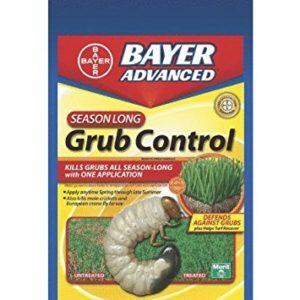 1 application of this Bayer Spray Grub Control kills grubs all season long. Apply anytime spring through late summer. Also kills mole crickets and European crane fly larvae. 32 oz. ready to use bottle. Just connect to a hose and spray. Treats 5000 sq. ft. Active: Imidacloprid (Merit). This article is part of our series on How To Control Lawn Insects. Another section of our site you might enjoy is Backyard Gardens. How to get Rid of Grubs Before you can start getting rid of grubs you must understand what they are and their mode of operation. Grubs are the larvae of Japanese beetles. They feed on the roots of your lawn leaving brown dead grass patches in the infected area.